Zach Bryant, Katie Fanning, and Tim Haber in The Country Wife. Photo by Jessica Briggs. BOTTOM LINE: A fresh variation on a historically notorious restoration comedy. 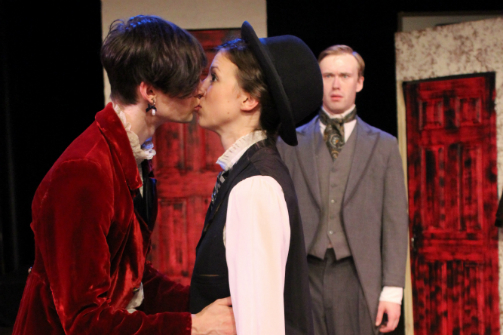 To kick off their season, Spicy Witch Productions invites audiences to consider gender fluidity and monogamy in The Country Wife and its adaptation The C*nt. Inspired by French farce, William Wycherley’s The Country Wife had long been considered highly controversial for its excess of sexual innuendo. It was well received initially in 1675 during the English Restoration, but shortly thereafter, The Country Wife was banned from the stage until the 1920s. Now, director Phoebe Brooks has repurposed Wycherley’s work for modern audiences to consider both past and present sensibilities on sexual freedom and gender fluidity. In Wycherley’s original text, the principle character Horner feigns impotence in order to be permitted time alone with socially respectable women. Under Brooks’ direction however, Horner (Zach Bryant) is not feigning any sort of identity—he opens the show coming out as androgynous. It’s neither a trick nor an obscure plot to bed as many women as possible. He sincerely no longer feels the need to conform with gender binaries. But this doesn’t stop the women in the play from finding Horner irresistibly attractive. Shortly after embracing his androgyny, Old Lady Squeamish (Samantha Nugent) visits to drop off her daughter Lady Dainty Fidget (Hannah Hammel)—believing Horner to be entirely uninterested in women now that he’s not “entirely” a man, Squeamish believes it socially acceptable to leave her daughter alone with him. But, when she’s not looking, Horner’s naturally flirtatious disposition quickly seduces Fidget. However, Horner has also noticed a new woman in town, Mrs. Margery Pinchwife (Katie Fanning). She’s only visiting town for a short while under the tight supervision of her jealous husband, Mr. Jack Pinchwife (Tim Haber). Despite Jack’s best attempts at keeping Margery hidden from other men, all Horner needed was one accidental glance in Margery’s direction to become absolutely spellbound. Meanwhile, Horner’s friend Mr. Sparkish (Zach Libresco), an equal in both wit and trickery, falls head over heels in love with Jack’s sister Ms. Alithea Pinchwife (Kristin Guerin). But, she’s set to be married to the simple minded Frank Dorilant (Isaac Allen Miller). Thus begins the farcical chaos as each character attempts to plot and trick their way to getting what they want. The choice to make Horner androgynous adds a fascinating twist. Horner is still a master of deceit, but because he’s staying true to his identity the tricks simply feel like an extension of his personality. This in turn makes for subtle yet significant changes in how Horner fits within the world of the play. All the women accept or even embrace his identity in their own way, yet the men have dramatically varying reactions. These relationships are nearly identical in Wycherley’s original text, but the one change to Horner’s character makes all his relationships take on new meanings. The cast works wonderfully together to show how each character does (or doesn’t) fit within the rules and conventions of The Country Wife. Fanning’s performance as Margery is especially engaging. Margery seems forever giddy and content (even when Jack locks her in her bedroom) but Fanning’s performance is so nuanced she cues the audience to her dissatisfaction even if there’s still a child-like grin across her face. Robert Bursztyn’s set design in conjunction with Megan McQueeney’s props also work wonderfully together. Everything from visible basics like the three doors upstage to details like the gynic piece of china in Horner’s home reminds the audience of the kind of farcical world we’re watching. Brooks’ direction takes a lot of interesting and thought provoking risks – presenting a classic in a way that feels new and relevant is extraordinarily challenging and this production succeeds. However, I have to wonder if the changes to Wycherley’s text also changed the pace of it. Despite Horner’s dramatic difference in appearance and identity compared to the other characters, especially considering the show’s set in 1905, the stakes don’t feel very high. Even Jack’s distaste for Horner feels secondary, and the show’s urgency doesn’t pick up until Margery begins her own plot to finally be with Horner alone. Otherwise, The Country Wife along with its adaptation The C*nt makes for a thoughtfully engaging and funny weekend of theatre. So, please, go get yourself a season pass and see what Spicy Witch Productions has to offer—you’ll thank me later.